Dan Plazak - Photo and dog (Tasha) courtesy of John Meyer. As a geologist, I have long been interested in fraud and deceit in the mining industry. Although mining fraud is rare today (unfortunately, it is not entirely gone), 100 years ago it was much more common. Until about World War I, fraud played a significant role in American mining history. But when I wanted to read more on the subject, there was no book on the history of mining swindles, so I had to write it myself. 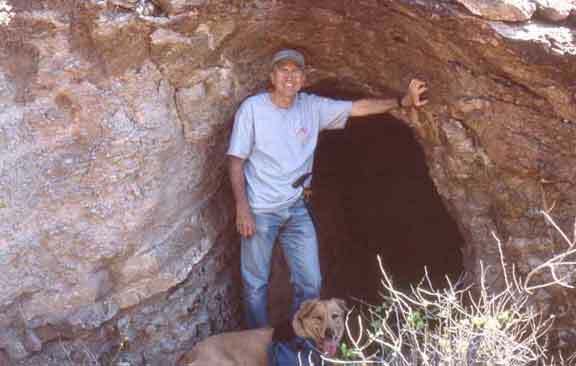 The result is A Hole in the Ground with a Liar at the Top, published in 2006 by the University of Utah Press. The Denver Mining Club has been kind enough to invite me to talk on a popular delusion of the 1890s and early 1900s that shales of central Kansas had economic quantities of non-assayable gold. The general public is always welcome at Denver Mining Club meetings. Mining history is a hobby. I make my living as a consulting geologist and engineer. information on any other mining frauds that I should include?